Community Center – Burlingame Historical Preservation Society, Inc. While the facility is booked with requests for usage often, the board of directors wanted to reaffirm to everyone that the building is indeed a community building, available for use by anyone, not just members of Burlingame Historical Preservation Society. Some exceptions apply. The Schuyler Community Center is located at 218 W. Fremont behind the Schuyler Museum. 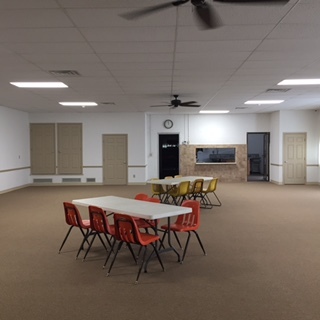 The facility consists of a large room with folding tables and chairs. A kitchen is available for use and is stocked with limited equipment. This facility is totally handicapped accessible. Bathroom facilities for both men and women are available as well. Our annual fundraising dinners are held here and it is used for craft exhibitors during the local annual Country Christmas festival. The center has become a popular location for family gatherings, parties, receptions, class reunions, public events, etc. Reservations must be made by calling. Call early to reserve your date, as some dates are reserved rapidly. No Smoking in the facility, including rest rooms and kitchen. No alcoholic beverages are allowed in the facility or on the Burlingame Historical Preservation Society property. Nothing shall be attached to the walls, ceiling fans or ceiling. No use of pins, thumb tacks, or tape or other adhesive on any surfaces. Failure to comply with the guidelines may cause forfeiture of the deposit. The person(s) requesting the facility is responsible for setting up and removing any decoration and making sure the Guidelines are followed. When using drink containers please use the drip catchers (found in the kitchen in the red 2 gal drink container in the corner) under the spigot to protect the carpet. You are welcome to use any utensils, pots or dishes but please return to their proper storage when cleaned. The person(s) requesting the use of the facility is responsible for leaving the facility as clean as was found. This includes: cleaning floors, tables, bathrooms, kitchen, emptying trash receptacles into dumpsters, replacing bags into trash receptacles, replacing chairs and tables as found. Vacuums are found in the east closet by the kitchen. Any linens used please hang on the sink and BHPS personnel will collect and launder. When leaving the building set the thermostat in winter to 60 degrees, summer 80 degrees, turn off lights and make sure all doors are locked. Return key to contact person within 48 hours. BHPS is not responsible for accidents or the loss of items left on the premises. BHPS has the responsibility and authority to make on the spot corrections of any violation of the above rules. The Burlingame Historical Preservation Society is a non-profit organization. There are costs involved in providing this facility for your use and enjoyment. The Community Center is equipped with video surveillance. Large community room with limited kitchen use…$55.00 per day. Deposit refundable if facility is left clean as per general rules. Deposit refundable if returned clean and in good condition within 48 hours.